Late last year I had a crazy idea. To be truthful, I had quite a few of them, but one in particular is worth sharing. 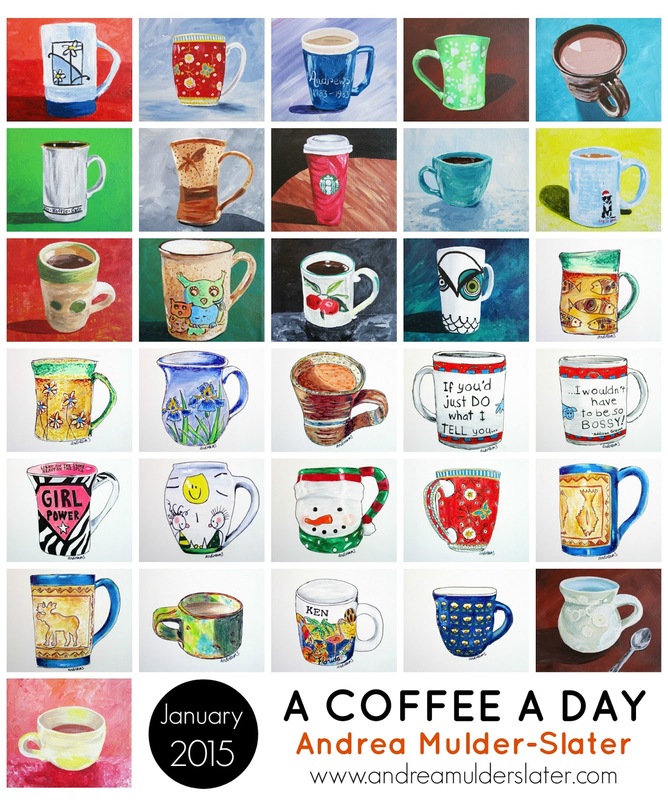 I decided to paint - or draw - a coffee cup a day. Every day. All year long. Whether or not I'll actually achieve my goal remains to be seen. Talk to me in July. But for now, here it is, February 1st and guess what? I've got thirty-one coffee cups to show you. I'm selling the acrylic on canvas paintings (unframed but ready to hang) for $45.00 and the drawings (matted and framed) for $50.00. Each of the paintings (colourful backgrounds) are 6" x 6", acrylic on canvas. Each of the drawings (white backgrounds) are 6" x 6", coloured pencil and ink on acid-free paper. To see individual photos, head on over to my Facebook page: http://www.facebook.com/andreamulderslater and stay tuned for my February paintings!